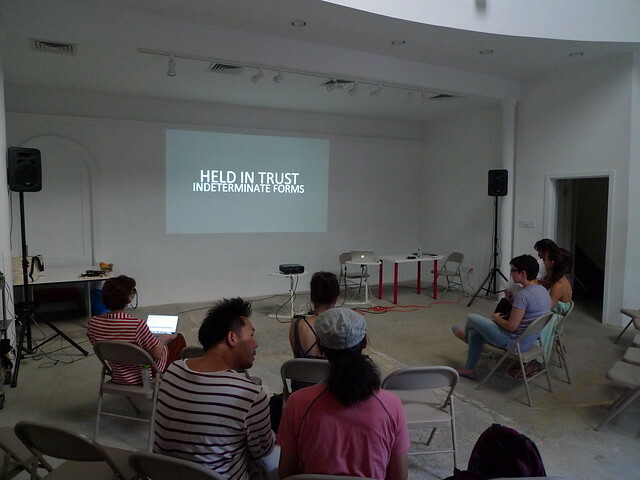 This discussion continues a two-year research project and the series of interviews led by curator Emily Zimmerman, focusing on the role of trust in artistic practices that test the boundaries between installation, performance, and participatory art. Works that move nimbly between performance and installation challenge viewers to operate outside of known codes for behavior. These situations are often riddled with an anxiety of participation, placing pressure on the tacit trust between the viewer and the artist. In August 2012, Zimmerman had moderated a panel discussion on this topic at RU with David Levine, Annie Dorsen and RU artists Irina Baldini and Masako Matsushita. Allison Berkoy is a New York based artist circling between mixed-media installation, performance, and projected image. Her hybrid spectacles have appeared inside galleries, music venues, theater stages, eateries, garages, a train caboose, and a salvaged lightship. Berkoy received an MFA from Rensselaer Polytechnic Institute in Integrated Electronic Arts, an MA in Performance Studies from New York University’s Tisch School of the Arts, and graduated from Northwestern University’s Theatre program. She has taught at Pratt Institute and New York City College of Technology (CUNY). As assistant curator at EMPAC, Emily Zimmerman has spearheaded commissions, curated exhibitions such as 'Uncertain Spectator' and 'Slow Wave: Seeing Sleep,' and organized EMPAC’s film series, as well as its ongoing lecture series. Prior to joining EMPAC in 2008, Zimmerman performed various roles for adventurous nonprofit arts organizations in New York City and Philadelphia, including Location One, Creative Time, Eyebeam, InLiquid, and the Institute of Contemporary Art. She holds a BA from New York University’s Gallatin School of Individualized Study, and an MA from the Center for Curatorial Studies at Bard College. Zimmerman was voted best emerging curator by Metroland in 2010, and was named a Loris Ledis Curatorial Fellow by BRIC Contemporary Arts. She is currently curator-in-residence at Residency Unlimited.